The company's fourth series of hockey cards, 1936-37 O-Pee-Chee Hockey breaks from the tradition of earlier sets. Players who appeared in previous sets were allowed to return. The pictures reverted back to black and white shots, but the backgrounds are, too. Finally, all the cards were die-cut, a first among major hockey card sets. 1936-37 O-Pee-Chee V304D Hockey card fronts feature a black and white player image superimposed against generic hockey-related artwork. A white banner at the bottom has the player's name. Part of the area above the player is die-cut, where the top of the card can be folded back and allow the card to stand on its own. Backs feature the player's vital stats within the are below the die-cut. They are written in both English and French. At the bottom is a line that identifies the card series and its number. There are 36 cards in the set. They're numbered 97 through 132 to continue the numbering scheme established from OPC's first set. Since they are die-cut, cards that have been bent are worth less than those that have not. Cards missing the top piece are considered damaged. Due to the fact that they are often found in lesser condition, these are the most valuable of the 1930s OPC cards. 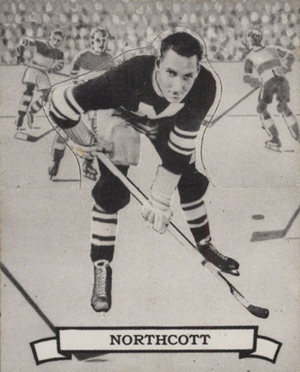 Key players in the 1936-37 O-Pee-Chee V304D Hockey include Howie Morenz, Eddie Shore, Turk Broda and King Clancy. I think this is a great set showcasing the history of hockey. The King Clancy card is amazing, I just purchased one missing the top but ai can not wait to get it.